Nothing But Truffle makes me drool. It's such a beautiful brown shade with a hint of redness to it. I am in LOVE with the gold shimmer it lets off in the light. I am never really a fan of brown colors; this one just calls out to me. 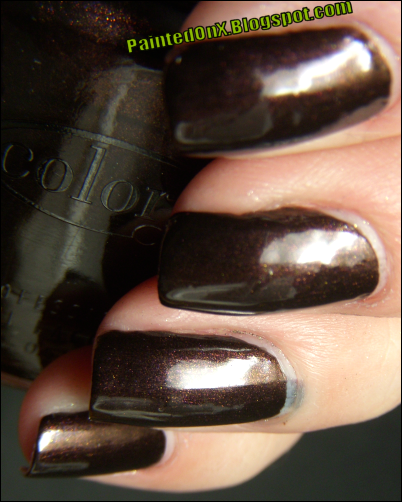 Do you have this color?...What do you think of it? Purple...This color is purple. Despite the pictures. I have seen so many pictures online of this color and they all show up blue like mine. Electronica is from Color Clubs "Dance To The Musique" Collection. This color stood out to me from this collection even though I is different from all of the swatches I had saw online. I like the purple even better. It's a deep purple shade with a blue type reflection, also packed with pink glitter. This shade doesn't dry and leave a rough surface like some glitters do. I used one coat of OPI's Ridge Filler Basecoat and 2 coats of Electronica. 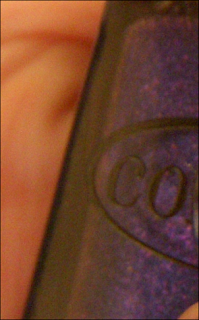 Here is a shady, and blurry shot, but you can kind of tell how its purple. It also shows what the pink glitter looks like. Copyright (c) 2014 Painted On.